Black cats have never had it easy. In some cultures–and for many individuals–they represent bad luck or misfortune. In fact, like black dogs, they’re often overlooked at shelters and rescues in favor of lighter colored, “more photogenic” types. 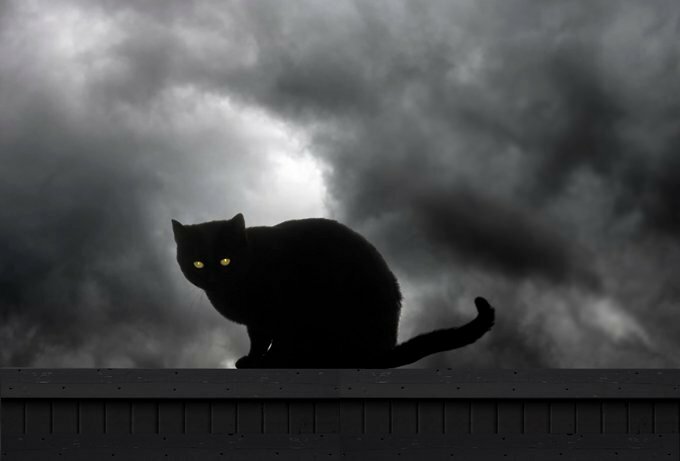 Perhaps most disturbingly, black cats are also sometimes targeted around Halloween for teasing and abuse–or worse. This Halloween, keep your cat inside. In addition, we advise taking this a step further: Keep him or her confined to a single room or area of the house. Freakish costumes (or even just a pointy witch’s hat or scary goblin mask) could send your cat fleeing through an open door. So don’t risk your animals’ safety or their life. Scottish lore maintains that a black cat’s appearance at your home leads to great wealth. In ancient Egypt, black cats were so revered that killing one was deemed a capital offense. The Bombay cat — the blackest of the black cats — was developed in Louisville, Kentucky in the late 50s. In England, giving a black cat to a bride is thought to bring her good luck. To fishermen, black cats ensure a safe journey home. Happy, safe Halloween to you and all your furry friends!